If you have arrived here from the Sew Sisters Blogathon Canada - Welcome, thanks for stopping by and hope you enjoy the blog hopping. 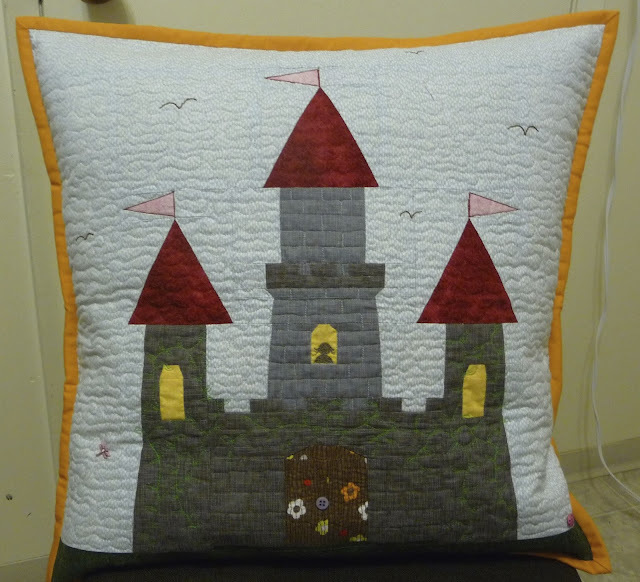 I made some great progress this weekend on the castle pillow. I had these gorgeous fabrics from Timeless Treasures called Matilda that I wanted to use on the back. I have a copy of the Pillow Pop book and love the 'Bunch of Crosses' pattern by Katy Jones. So I set to cutting out lots of strips and 2.5" squares. I wanted the back to be an envelope style as I am not keen putting zippers in! I struggled for a while with thinking I would have to have the pluses match up over the overlap. But it made the brain hurt too much so decided I should let it go and not worry about it! Natalia Bonner in her Free Motion Quilting book has a leaf and loops and a flower and loops design which thought would go well with the fabrics. So I decided to use the leaf design with the odd flower mixed in. I tried to make my leaf look like those on the fabric (or a close as I could get it!). 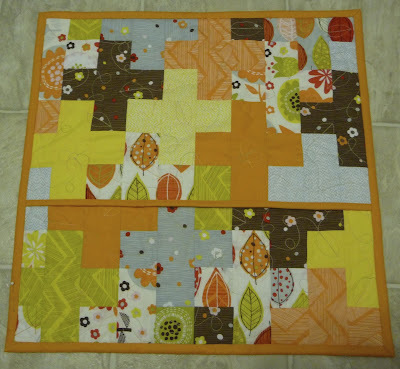 I bound the edges of the overlap using a normal quilt binding in the lovely orange solid. I would usually hand stitch down the binding to finish it off, but I thought I would use the machine instead. It worked! I am always quite surprised when I try something new and it actually works! Although it worked well here, it had (what I consider) quite a large flap on the back that I wasn't so keen on. So I don't think I will make it my regular binding finishing method. Next I turned my attention back to the front of the cushion. I talked about the making of it here and here. I felt the castle needed some embellishment to brighten it up a little. I started by adding a person into one of the windows and some vines growing up the castle walls. These pictures don't do the much for the colours, that's what comes of finishing things late in the evening and not having good lighting! I have just put a cushion pad inside and can see I will have to add a couple of buttons to the back to keep it closed together properly. I am really pleased with it! My only real concern is that there isn't much pink on this cushion and the littlest one is a very pink person. She saw the backing on the design wall whilst under construction and I asked her what she thought of the fabrics, and she didn't seem overly impressed with them! Perhaps altogether with the castle she will have a different response… So now onto planning the princess party and to making a castle cake! It's all about the castle this year, oh to be 5 again! Linking to A Lovely Year of Finishes. Oh what fun! I really like all your projects...love your choices of fabric, very pretty. This is my first time to the blogathon...it really is nice to see the wonderful projects everyone makes! Wow! What an awesome pillow. Love it! Thanks for sharing your process. Your quilting is great on that castle...I love the detail! Great job. LOVE the pillow! How cool! Wow! I love how this pillow turned out! great pillow - the back looks awesome! Just stopping by on my Blogathon tour. The castle pillow is awesome. I am sure your little princess is going to love it. The back is so interesting. Love the pillow and your quilting is great!